Consistent and accurate prints as a result of color calibration and attention to detail All Prints backprinted with file name. We offer a Touch and No Touch option for printing. No Touch – Files are printed as submitted, no operator interaction. Touch – Files are each individually analyzed for color and density and reprinted if necessary to achieve a professional looking color and density corrected print. Proof books are spiral bound and come with a frosted cover and a leatherette back. They can be made with our standard cover or you can make your own custom cover and submit it with your order. Just tell us the file name and we’ll make it for you. All prints are back printed with original file name. Choice of white or black background. Choice of three border thicknesses in black or white for 5×7 and smaller books. Or you may submit your images with your own custom border. Choice of black or clear coil bind. Images can be horizontal or vertical, but the files must be rotated to all be the same orientation. Files must be sized at 4×6 at 300dpi. Delays and fees may apply if this requirement is not met. Files must be saved in JPEG format. Level 10 compression is recommended or as a pdf document. Pre-rendered pages created by you are accepted so that the design and creativity are unique to you. Pro Photo Albums are professionally-crafted, do-it-yourself albums that allow photographers the ability to take control of the photo album process simply and cost effectively. The albums are perfect for any type of photo album or presentation, including wedding albums, family photo session albums, portfolio presentations, graduates and High School Senior sessions, and more. Available in 2.5 in. x 3.5 in., 5 in. x 7 in., 8 in. x 8 in., 8 in. x 10 in., and 10 in. x 10 in. sizes, the albums are extremely easy to use with a peel-and-stick PSA adhesive. The album covers are made of a rich leatherette material, available in black or white. Just order standard size prints as single images or create your own photo collage or composite of images on a single print. You can receive your album separate from your prints so that you can assemble the album yourself, or we can do it for you for just an additional 30.00. Album Prints are a great way to order your album prints ready to be assembled by your or your album provider. 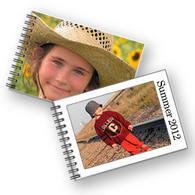 We offer the most common album page spread sizes. Pages are printed one sided only and are ready for assembly. We do not assemble your albums for you. 8×10 Album prints are printed on traditional silver halide photographic Kodak papers. Album prints 10×10 and larger are produced on our Professional Epson printer, using professional lustre papers and pigmented inks.